John "Reuben" Minerd was born in 1860 on the state line of Indiana and Ohio, near the town of Monroeville, Allen County, IN, the son of James and Martha Jane (Sheehan) Minerd. He was the third consecutive generation to own the Minerd family farm which his pioneer grandparents originally settled. Tragically, Reuben was one of four siblings, but also was raised with a foster sister, Catherine "Kate" Singer, and with fatherless first cousins Mentzer and Corwin Tilbury. 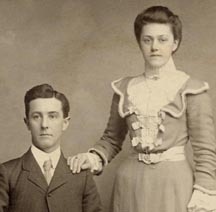 On Aug. 7, 1901, Reuben married Alice Maude Bell (1883-1974), a native of Paulding County, OH and the daughter of Edwin and Mary (Craven) Bell. Reuben was 23 years older than his bride. The Minerds had two children -- Reuben Perry "Corwin" Minerd and Goldie Ethel Moennig. They are said to have named their daughter after "Goldie Morgan," the adopted daughter of a local judge. The Minerds resided on the family farm on the state line, near Dixon, OH and Monroeville, IN. A terrible fire burned down the Minerds' old original pioneer house in 1917. Reuben's elderly father was injured in the calamity, and the news was published in the Fort Wayne newspapers. For prices ranging from $725 to $1,995, the customer received plans, specifications, instructions and all the material needed: lumber, shingles, mouldings, doors, windows, frames, hardware, varnish and paints. Plumbing, wiring and heating systems were extra and had to be ordered separately, but were also available through the catalogs. Circa 1927-1928, the Minerds provided care for Reuben's aging father, who was bedfast in their home. After the father's death in 1929, the ownership of the farm passed into Reuben's hands. One of the farm's features were the plentiful orchard trees seen here, at a date unknown. Daughter Goldie is believed to be standing in this view, wearing a light dress, barely visible toward the left-center of the photo. I hope Reuben has been as prosperous this year as we are told over the radio that all farmers are. It's some consolation that somebody is prosperous. We are all praying for better times but where they are coming from nobody seems to know. We would like to know how Reuben likes the farm regulations under Roosevelt. Are they better than the old ways. I understand there are no restrictions now - on the amount of grain and the number of pigs - you raise. I would set out the entire farm in pigs!! In the winter of 1934, the Minerds learned of the death of Reuben's aunt Matilda (Bodle) Minerd in Carson City, MI. They forwarded the news to Corwin Tilbury in Pittsburgh. In reply, Corwin wrote: "So Aunt Matilda is gone; do I know how old she was? Must have been near 90." In late July 1932, the Van Wert Daily Bulletin reported that the Minerds were hosting a visit from Corwin and Mentzer Filbury (sic) of Pittsburgh. In addition to farming, son Corwin was a skilled mechanic and ran his own radio sales and repair business near Monroeville. The ad seen at right was published at some point in the Monroeville News. In a letter to Corwin's sister Goldie in 1927, cousin Corwin Tilbury wrote from Pittsburgh: "Tell Corwin my Radio is on the bum and for him to come over and fix it -- but not at 50 cents a mile!!" Reuben and Alice celebrated their 50th wedding anniversary on Aug. 7, 1951. The Fort Wayne News Sentinel published their photos and a short article, saying "The couple celebrated Sunday with a dinner for the family and several close friends. The Minerds received friends Sunday afternoon and evening, among them five of the wedding guests present at the ceremony 50 years ago, Mrs. Joe Kilgore, Edgerton; Mrs. Albert Carrier, Fort Wayne; Charles Bell, New Haven, and Mr. and Mrs. Henry Neadstine, of Dixon." At age 93, in 1954, Reuben passed away in the Parkview Memorial Hospital in Fort Wayne, Allen County, IN. He was laid to rest at Monroeville Memorial Cemetery. In his will, Reuben stated that "out of the assets of my estate there should be a suitable marker placed at the graves of my father, James Minerd, and my mother, Martha Jane Minerd." The markers were installed at Sugar Ridge Cemetery near their home. At the age of 90, Alice was hospitalized at the Adams County Memorial Hospital in Decatur, IN. She died there on March 9, 1974. She was buried with her husband. Son Reuben Perry "Corwin" Minerd (1903-1977) was born on April 14, 1903 on the family farm. He inherited the property, and raised his family there. He married Evelyn M. Sorg (1924-1992), the daughter of Lawrence and Flora L. (Till) Sorg. Their wedding photo is seen here -- there was a 19-year gap in age between them. Corwin's obituary in the Van Wert (OH) Times-Bulletin said he "was a native and lifetime resident of Allen County, Indiana and had been actively engaged in farming until last spring, when he retired due to ill health." One year, Corwin helped to re-enact "the controversial first election (1841) in Monroe Township and the 'first settlers' [as] part of the Monroeville Centennial Pageant ... at the Monroeville Fair." He was pictured in a commemorative edition of the Monroeville News. Corwin died in September 1977. Evelyn survived him by 15 years, residing in New Haven, Allen County. She died on Oct. 16, 1992 at the age of 68. Daughter Goldie Ethel Minerd (1906-1998) was born on May 2, 1906. She married Edward Herman Moennig (1900-1992), who was five years her senior. They had two children -- Lowell E. Moennig and Gloria An Carey. The Moennigs resided in Fort Wayne. Goldie was a longtime piano and organ teacher. She also trained at Hammond Electric Organ Company as an electric organ technician for General Organ Service. Later, she was the first woman Wurlitzer organ technician in the United States, and owned the GEM Organ Service Company. Goldie had a green thumb and was flower show chair for the Fort Wayne Community Schools for about two decades. Edward owned General Radio and TV Service and later General Organ Service. He died at the age of 91 on Feb. 25, 1992, in Riverbend Nursing Home in Fort Wayne. Goldie outlived her husband by six years. She passed away in Fort Wayne on Dec. 15, 1998. They are buried together at Greenlawn Cemetery in Fort Wayne. 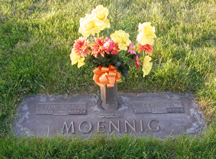 Son Lowell E. Moennig (1938-2007) was born on Oct. 18, 1938. He wed Sharon J. (?) (1941-2013). They had two daughters, Laurie Wenger and Beth A. Snyder. Lowell was a teacher for Fort Wayne Community Schools for 16 years, retiring in 1997. After a decade of retirement, he passed away on Dec. 30, 2007, at Hospice Home in Fort Wayne. Sharon outlived him by five and a half years. She died at the age of 72 on May 16, 2013. Her obituary in the Fort Wayne Journal Gazette said she was survived by four grandchildren. 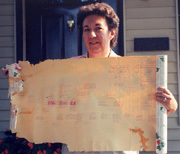 Granddaughter Karen Wagonrod is seen here holding a home-made Minerd-Sorg family tree she drew as a teenager on the back of a roll of wallpaper. She and her family attended the national Minerd- Miner- Minor Reunion in 2004 featuring the theme of "Fallingwater." Grandson John Corwin Minerd still resides on the family farm, the fifth generation family member to occupy this historic agricultural property. For more information on this line, contact Gloria (Moennig) Carey and Karen (Minerd) Wagonrod.